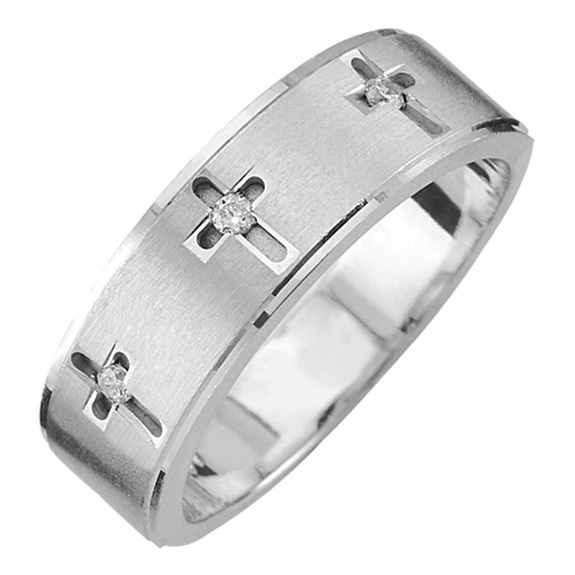 Three crosses adorn the center of this men's diamond cross wedding band ring crafted in pure .925 sterling silver. The three authentic white diamonds weigh 0.06 carats total. The band measures 7mm wide and is available in men's sizes 8-12, including half sizes. The cross ring is also available in white gold, shown below. We guarantee our Sterling Silver Men's Three Cross Diamond Wedding Band Ring to be high quality, authentic jewelry, as described above.